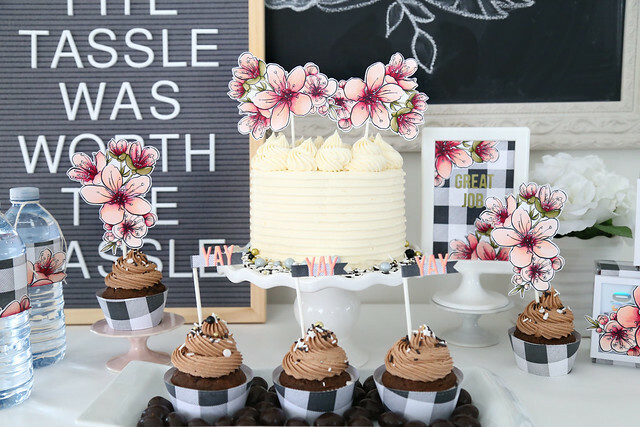 Every month I show you how Lawn Fawn products can be used for party decor. 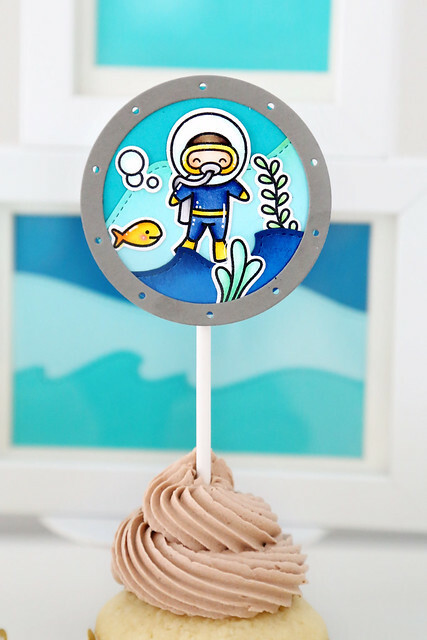 This month, I decided to go deep... for a scuba party! 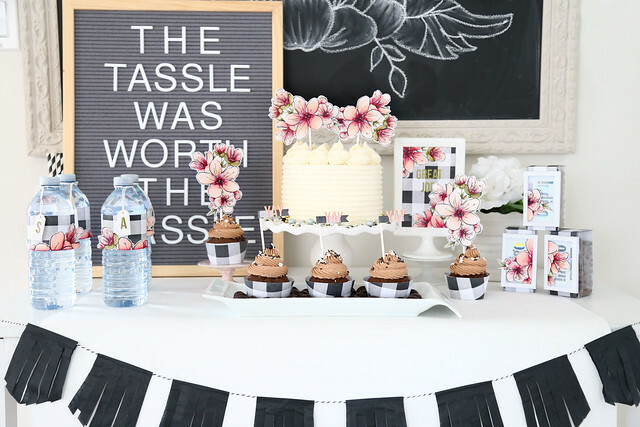 I used images from You Are Sublime to inspire this month's party theme. 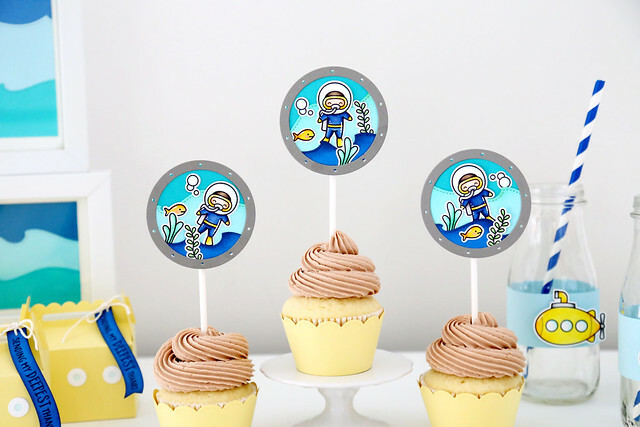 That scuba diver is so cute! 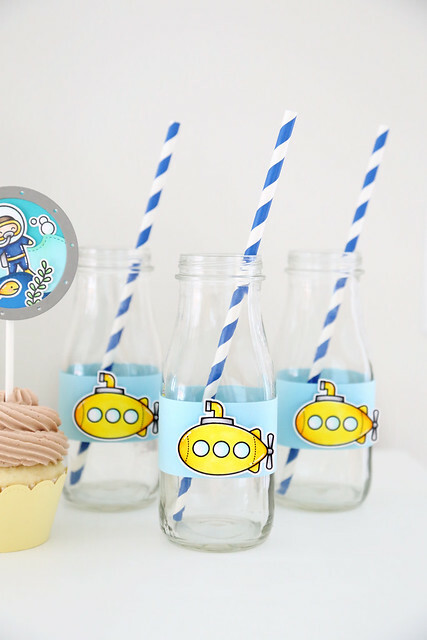 You can't have a scuba party without including a few yellow submarines! 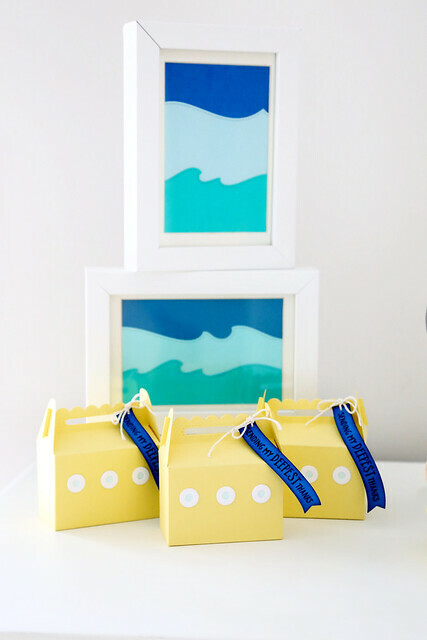 I cut a few Scalloped Treat Boxes out of yellow cardstock and used circle dies to mimic portholes. 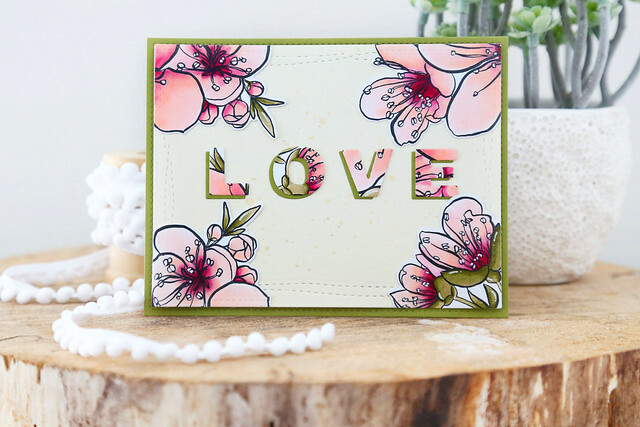 I attached a wavy banner (from the Shadow Box Card Ocean Add-On die set) stamped with a greeting from You Are Sublime. I love that the wave of the banner gives a nod to ocean waves! And by sponging the edges with a darker blue ink, the navy cardstock looks so much more deep and rich. To bring in more of the ocean theme, I came up with the simplest decor - but it really packs a punch! 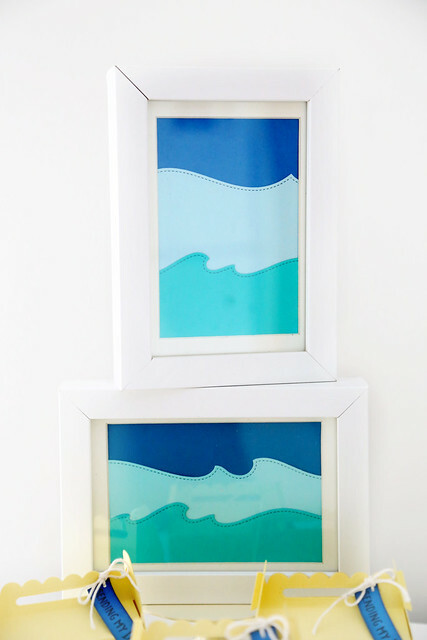 I grabbed a few picture frames I had lying around the house, and cut Stitched Wave Borders in shades of blue and layered them inside. I love this idea so much! 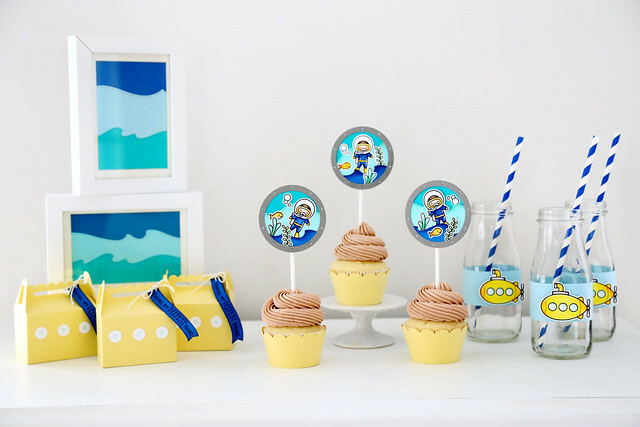 If I were hosting a full party, I would fill even more frames and have them all layered and stacked around the party table. The frames are from Ikea, by the way! 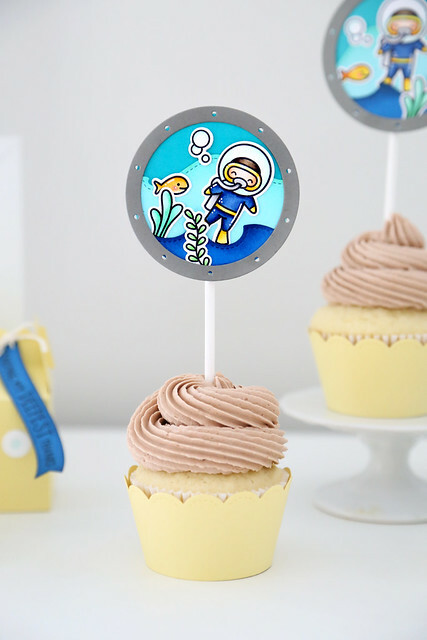 Since everything else on the table is on the simpler side, I went all out with the cupcake toppers. 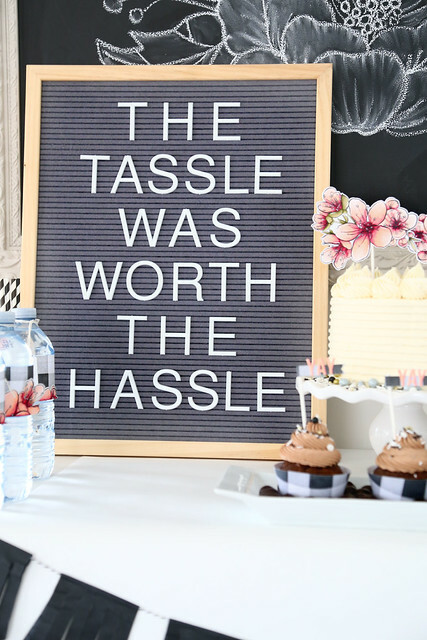 One special thing on your party table is enough to draw the eye in! 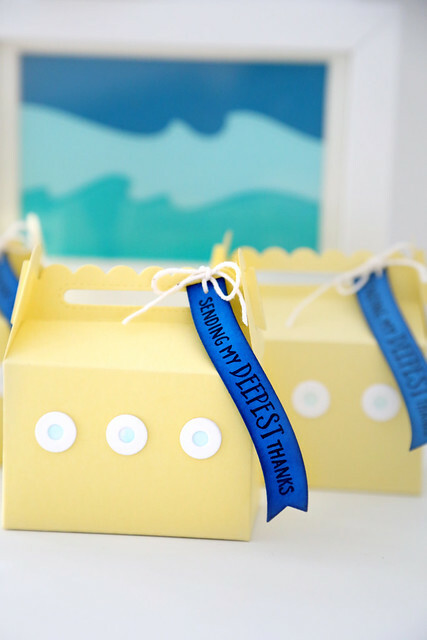 I cut yellow cupcake wrappers, and then created little scenes inside of Porthole Frames to stick inside of the cupcakes. Each scene is just a tiny bit different in how they are laid out, but all of the elements are the same. I used the Stitched Wave Borders inside the portholes, so add extra depth and interest. 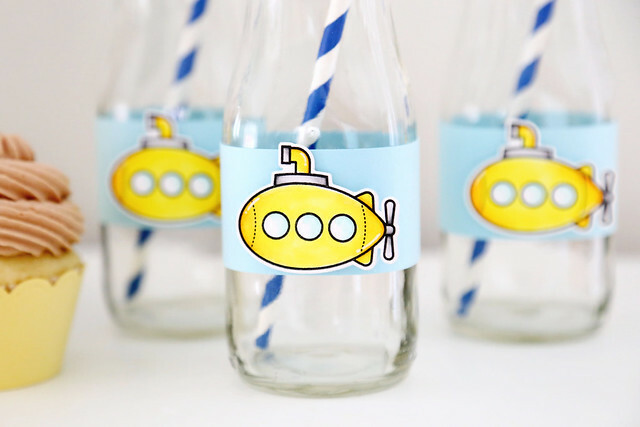 The yellow submarines make another appearance on the drink bottles! 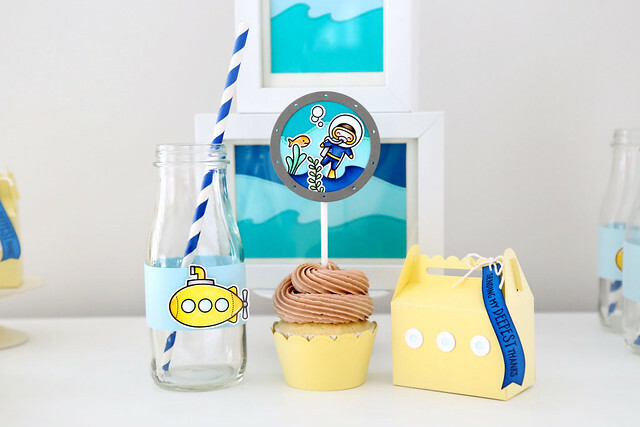 I always try to reinforce the party colors with each element on the table, so I used a lighter blue to wrap the bottle, and then brought in some navy in the straws. I hope you like it! This is one of my faves - while I was crafting it, it made me wish that my Thomas was still little! I would have loved to have created this for him a few years ago. Now, he's 11 and all into laser tag and PS4 games and "nothing too babyish." ha. I have so many birthday cards in my box, ready to send out. Thank you cards too, and so many other just because cards, but I found that I was missing some cards I could give out for summer weddings! 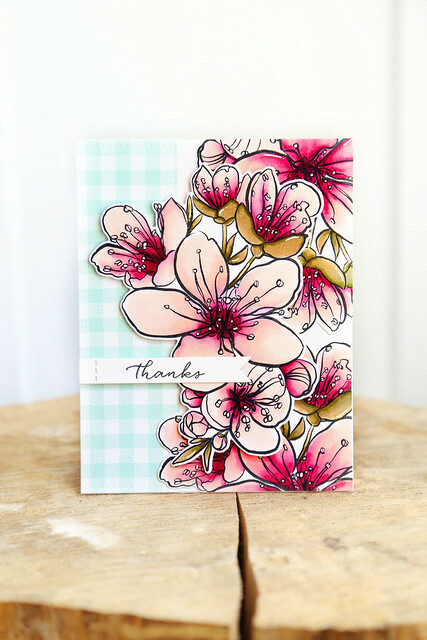 I started out by stamping the large flower cluster from Mondo Sakura 2 times, and colored them using copic markers. With one of the stems, I cut it to fit the 4 corners of my Wonky Stitches rectangle die. For the other one, I cut into it with the Classic Block Alpha letters to spell the word L-O-V-E. I also cut out the same 4 letters using an olive green cardstock that would match the green of the floral stems. 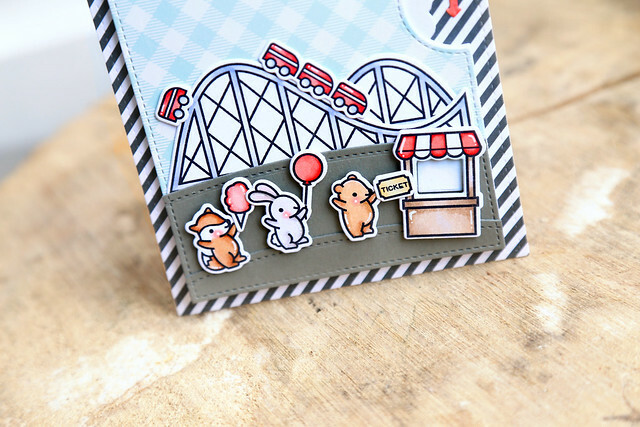 Lawn Fawn's summer release week continues with a closer look at some add-on dies for the Shadow Box Card. Isn't it too cute? It's a really simple design, and came together so easily, but looks really impressive. I colored 3 of the musical critters from Critter Concert, and framed them out using the curtains from the Theater Add-On set. 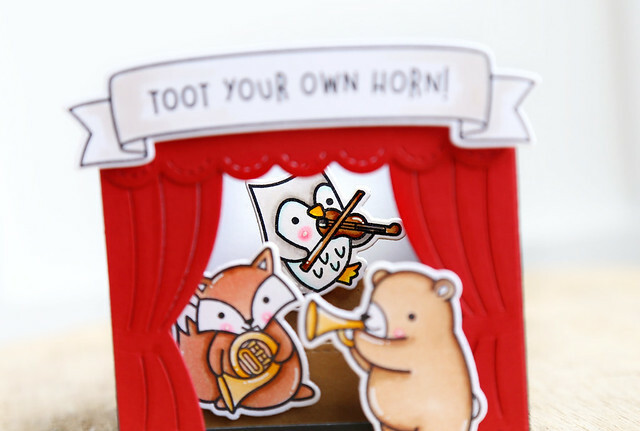 That owl playing the violin is so adorable. I love that the whole thing folds flat and fits into a standard envelope. I hope you like what I created today! Be sure to check out the LF blog this morning for a lot more inspiration - click! 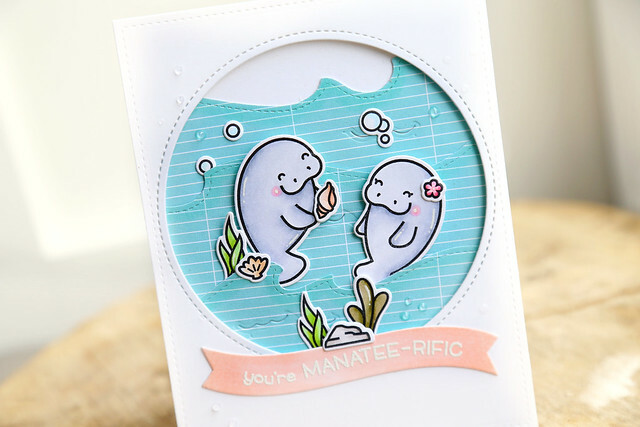 This is my second post of the day - if you're looking for Lawn Fawn's chubby manatees, scroll down! 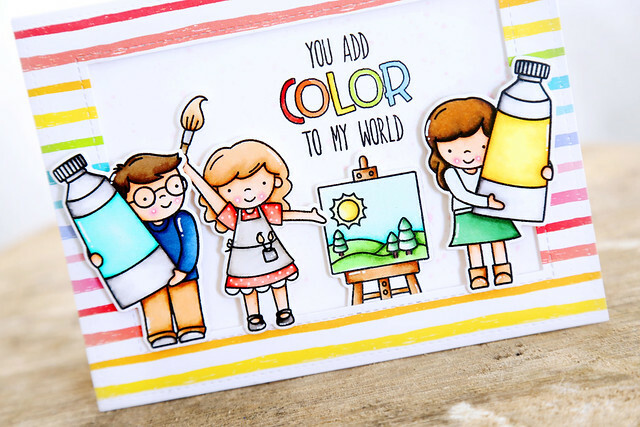 I have a sweet card to share, using a set from the newest Neat and Tangled release, Paint Night. 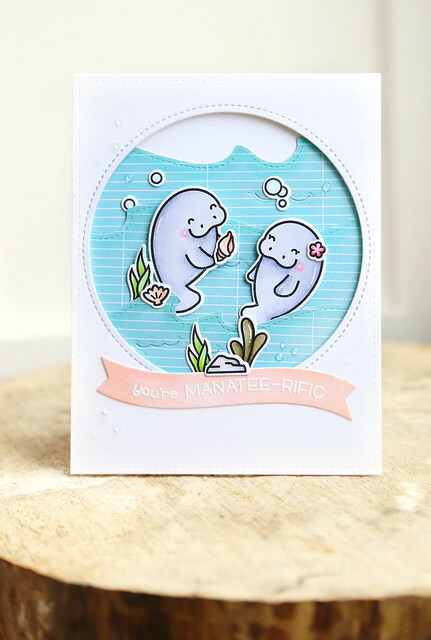 Lawn Fawn's summer release week continues with these cute and very fat manatees. ha. They are ready for a shell-abration! To bring interest to the waves, I cut them out of a paper from the Really Rainbow pad, and did some sponging at the top of each wave to add dimension. I white-heat-embossed the sentiment into a wavy banner, from the Shadow Box Card Ocean Add-On. 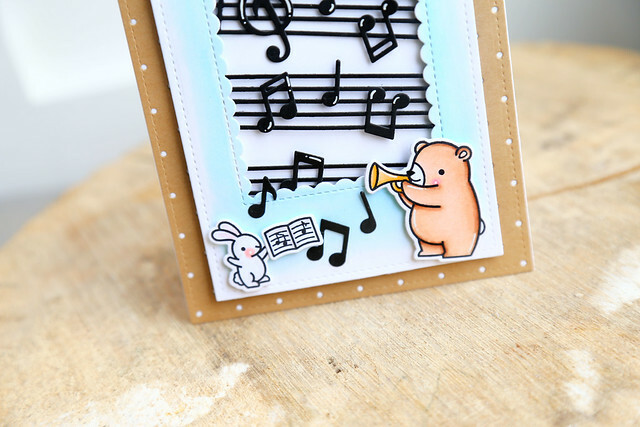 I paired the bear from Critter Concert with the sheet-music-holding bunny from Coaster Critters and then die-cut a few bars of Little Music Notes. 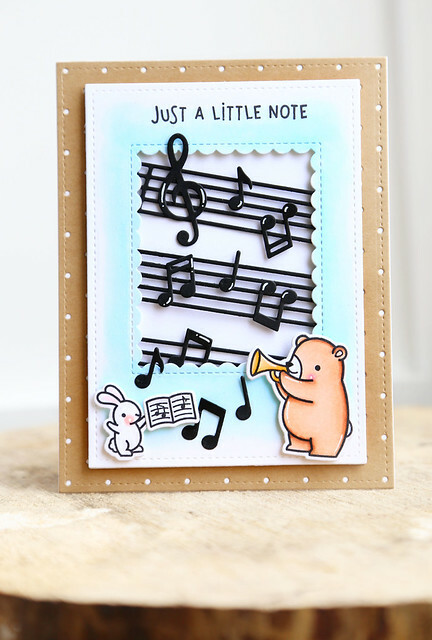 I framed out the music notes using the scalloped rectangle die from the Shadow Box Card Ocean Add-On die (more of that coming soon!) I used a light blue ink to give a subtle wash of color to make sure that the music notes really popped from behind. On the card base, I die-cut a kraft layer of the Itsy Bitsy Polka Dot Backdrop. I hope you like what I've created today! 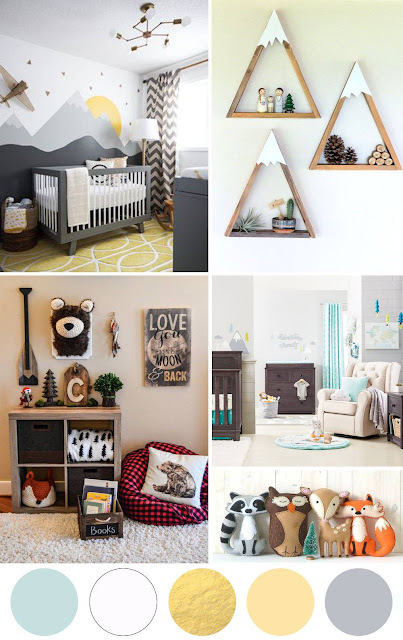 There's more to see on the LF blog this morning - click! I also used a new Porthole frame, so that it looks like you are standing inside the sub, peeking through the window into the ocean scene outside. I added the sentiment onto a banner flag (new as well!) and did some shading around the edges of the grey card base. 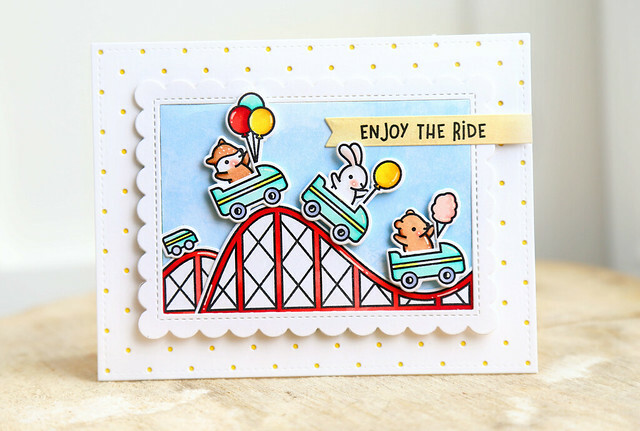 I used Coaster Critters again, because they are so cute! Do you spy the arrow on the side? and the open window with the word TERRIFIC inside? Spin the wheel, and you can reveal other words! ps, I was supposed to take a video of the card spinning, but Maia got her grubby little hands on it and now I can't find it anywhere. She insisted on this being her birthday card. 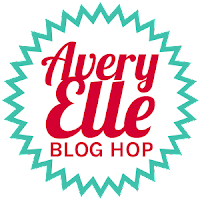 Avery Elle summer release blog hop! This is my 3rd post today! If you're looking for new Lawn Fawn, or new Neat and Tangled, scroll down! It's time for brand new Avery Elle! I love them so much! 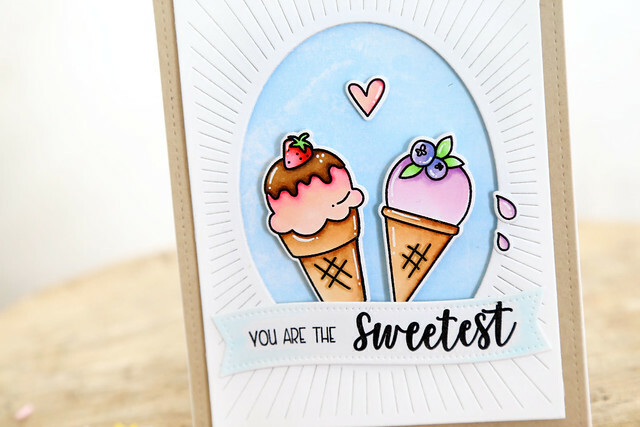 I colored a strawberry ice cream and a blueberry one and popped them into a *brand new* Oval Burst die. I'm so excited about that one! 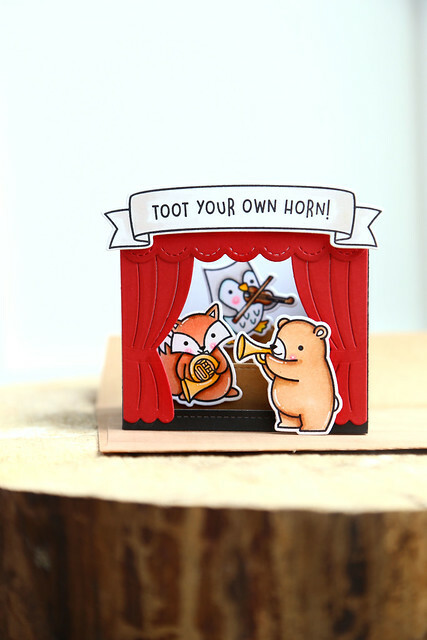 I hope you like my card, and be sure to check out the other design team blogs today! To celebrate our Summer 2018 Release Blog Hop, Avery Elle is giving away a $25 Gift Certificate to one random winner. To enter to win just comment on this post. There is no purchase necessary and you must be 18 years of age or older to enter. This giveaway is void where prohibited. You can also do options 2, 3, 4, 5 or all 6 of the following to increase your chances of winning. You have until midnight Sunday, May 13th to enter. The winner will be announced on the Avery Elle Blog on Monday, May 14th . All products are available for purchase in the Avery Elle store right now. This is my second post today. For new Lawn Fawn, scroll down! They can be used with the artists from Paint Night (I sized them to all match) or on their own. 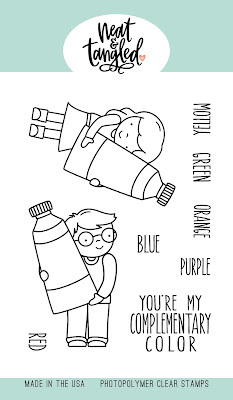 They make for an adorable card for your loved one. I had to look up a color wheel to see which colors were complementary - ha! I'm hoping this doesn't come off as too Christmas-y. I gave the couple matching outfits, which is already so adorable, and then add in the way the little girl is looking down a bit and the boy is giving her a sideways glance and I'm loving them too much. I hope you like it! This card just makes me smile. Don't forget to leave me a comment before you go! Danielle will be a winning comment from among the design team's posts for this week and award a $25 gift card to the NT store. 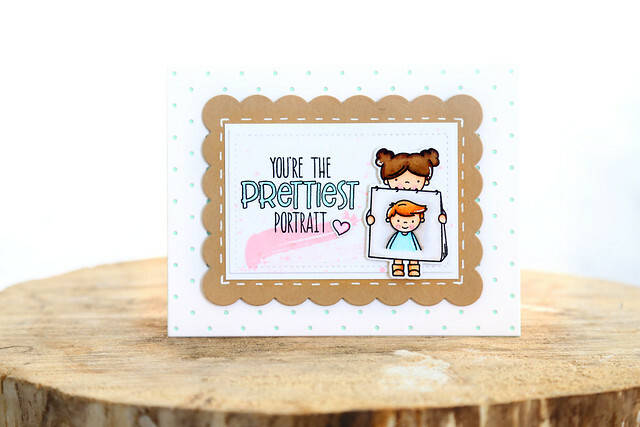 Check out the Neat and Tangled blog today for more of these cuties - click! 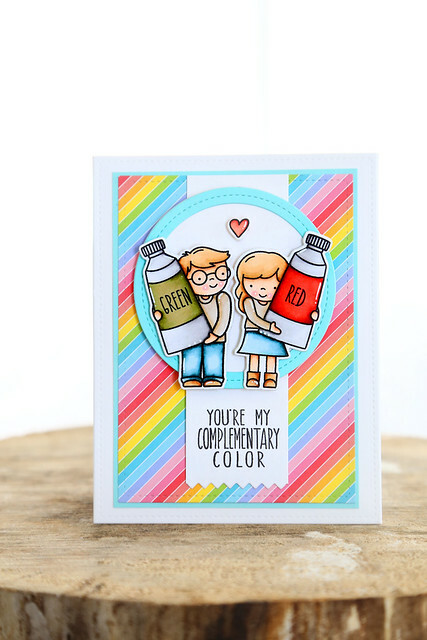 Lawn Fawn's summer release is fantastic and we'll be showing it off on the blog all week long! At the end of the week, on May 17th, you will be able to purchase all of the new goodies. Isn't it adorable? I layered the roller coaster pieces, and put a tiny car on the back layer to make this roller coaster look huge! 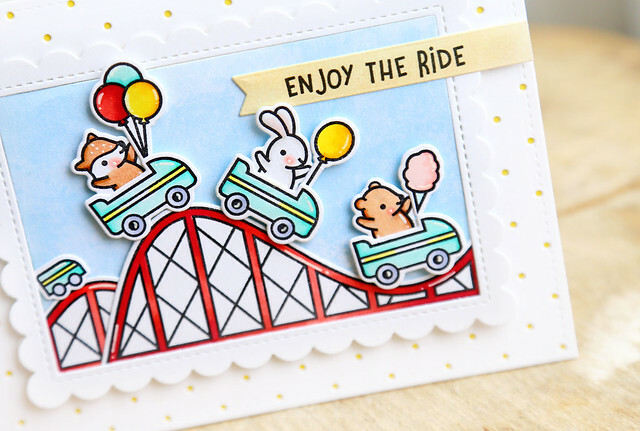 The main critters are riding with party balloons and cotton candy. 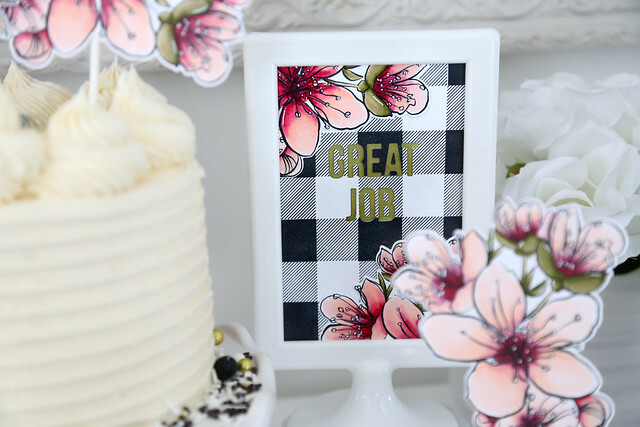 I popped the whole scene into a new Stitched Scalloped Rectangle Frame, and then onto an Itsy Bitsy Polka Dot Backdrop cover-plate. I love that cover-plate so much! You could change up the look by layering whatever colors together and it is so delicate and subtle. I hope you like what you see so far! Check out the LF blog this morning for more - click! 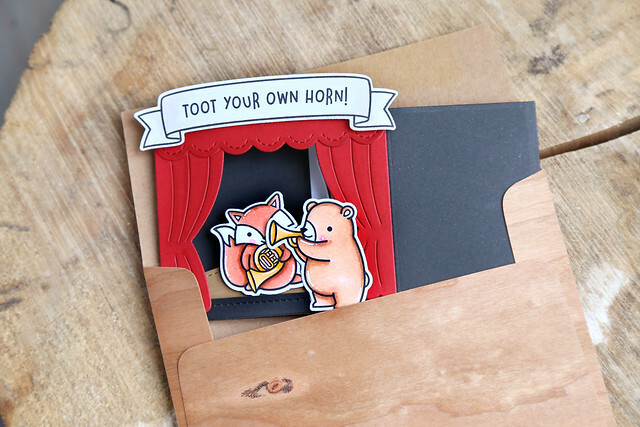 Hi there, and welcome back to our 3rd day of new reveals over at Neat and Tangled. All of the products shown this week will hit the store at 8am EST on Friday. 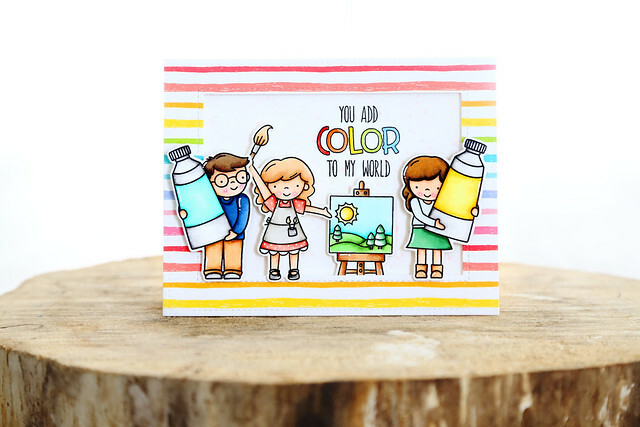 Today, we're showing off a gorgeous set designed by Miriam - Layered Landscape. I put down my copic markers and made a card that came together in under 20 minutes - I didn't even know things like this were possible. ha. 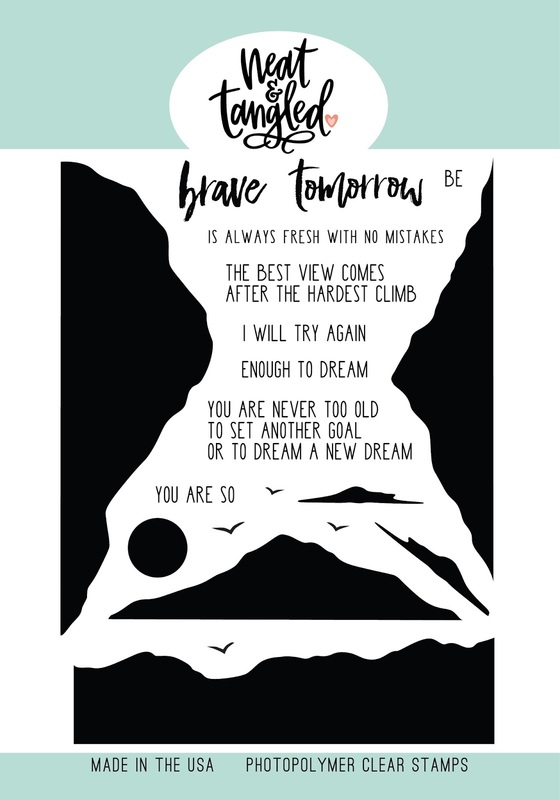 I stamped the mountains from the top down - starting with the lightest and working my way down to the darkest. I used shades of blue, and did absolutely no masking since the darker colors covered up the edges of the lighter shades. I did the tiniest bit of shading with coordinating markers (ok, so I didn't put them down all the way) to add depth to the darker 2 mountain layers. My lightbulb moment was grabbing the Calathea stamp set and using one of the images to create a forest of black trees at the base of the mountain-scape. I cut the panel below the trees and stamped the sentiment (from Anne of Green Gables! yay!) onto the base layer. I hope you like it! This is definitely a different look for me. Don't forget to leave a comment here before you go! 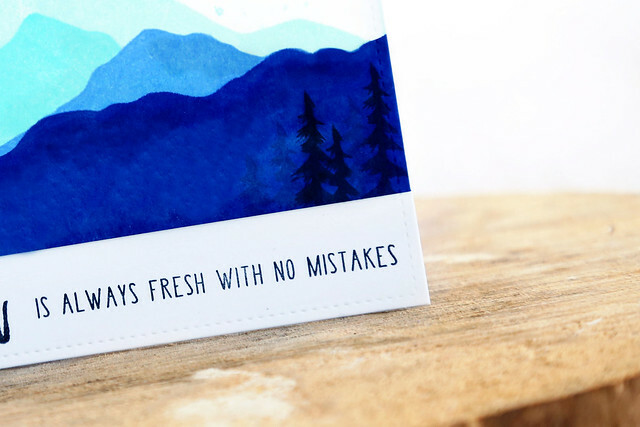 A winner will be chosen from among the design team's blog posts and announced on Friday morning - you could win a $25 gift card to the NT store. There is a lot more to see on the Neat and Tangled blog this morning - click! I'm really excited to show off the first of my art-themed sets for the month, Paint Night. 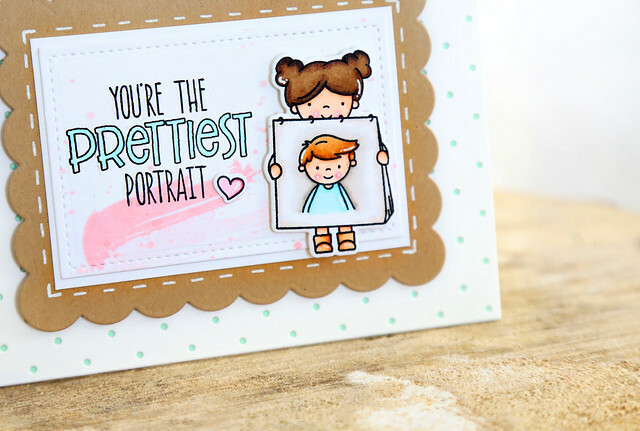 It features a couple of artists, an easel with a few different artwork options, and some super cute sentiments! I popped her ginger-haired friend into the pad, and added the sentiment to the left. I used the paint swish image (seriously? my mind is blank right now to call it anything else) underneath and adhered a tiny heart to sweeten the card even more. 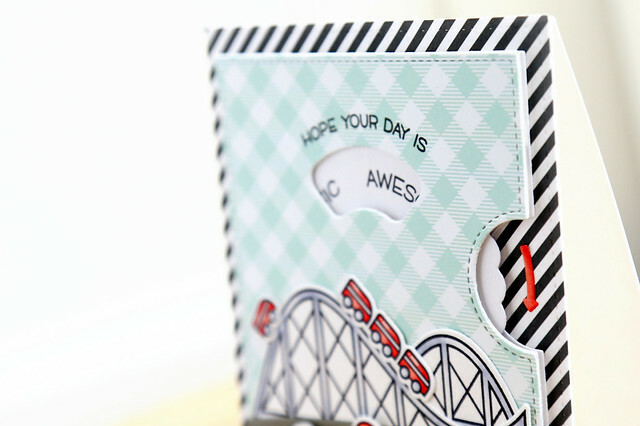 In case you're wondering, that polka dot coverplate is a sneak peek of something coming to Lawn Fawn later this week! yay! 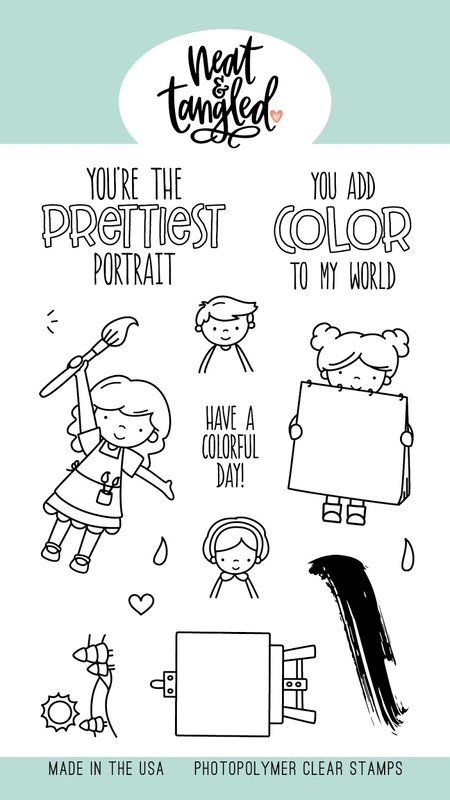 My next card features a couple of extra artists - you'll meet them later in the week! I colored the sentiment letters in colors to match the rainbow-striped background paper and added the artists to fill the frame. The landscape image is my favorite - it looks so cute popped into the easel's canvas! The girl holding the paintbrush from this set is joined by 2 other cuties holding huge tubes of paint. I don't usually draw 2 stamp sets that coordinate together, but one art-themed set didn't seem like enough! I hope you like what I created for you! There's more to see on the NT blog this morning - click! And don't forget to leave a comment here before you go! At the end of the week, one comment will be chosen from among the design team's blog posts for the week - you could win a $25 gift card to the Neat and Tangled store. 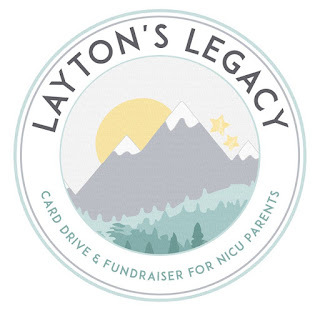 This event was organized by Lea Lawson, in her son Layton's honor, to help the families of children in the NICU at the University of Minnesota Masonic Children's Hospital. There are 50 beds in that NICU, and they are always filled. 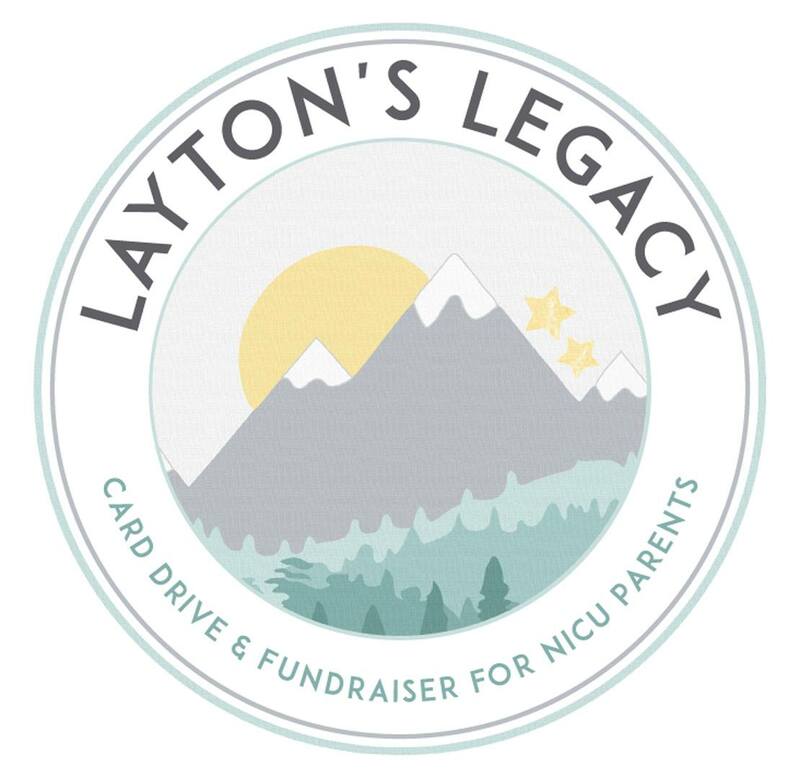 In honor of Layton's birthday, Lea is fundraising to be able to purchase Starbucks gift cards for parents who find themselves thrust into NICU life. Please read more of Lea's story in her own words - click HERE. -My affiliate linking dollars will be donated thru May 19th. 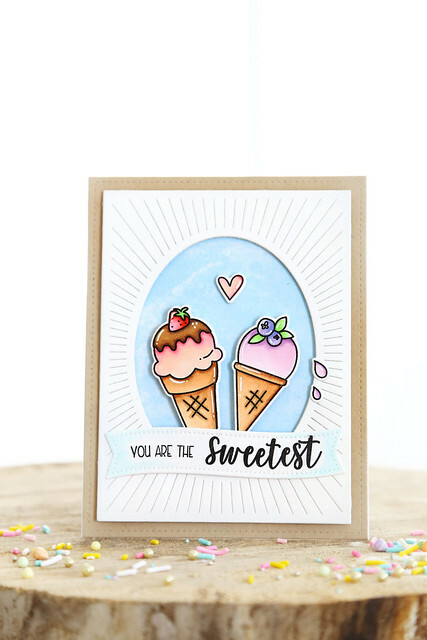 I used Pinkfresh Studio's Escape the Ordinary stamp and matching die set to craft this card. 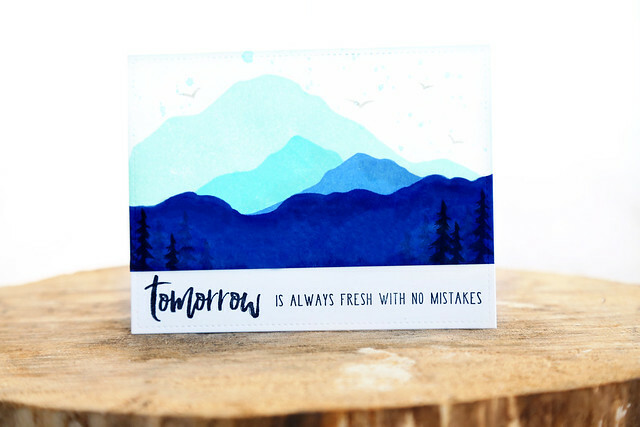 I did some ink blending to create a deep blue sky, and added an encouraging sentiment to the bottom. This is my second post today - scroll down if you're looking for my Neat and Tangled card! 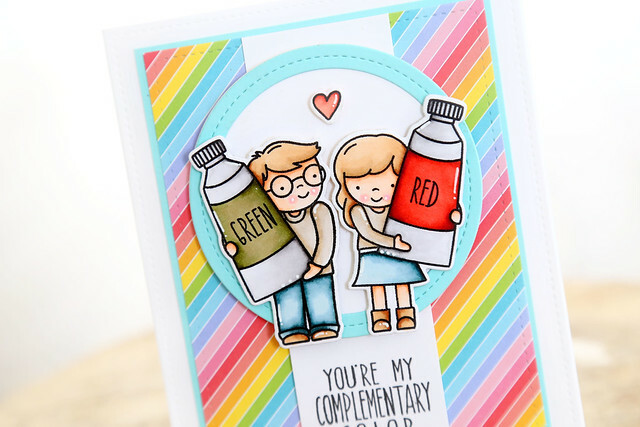 Have you seen the newly-released Essentials by Ellen stamps and dies? These flowers! 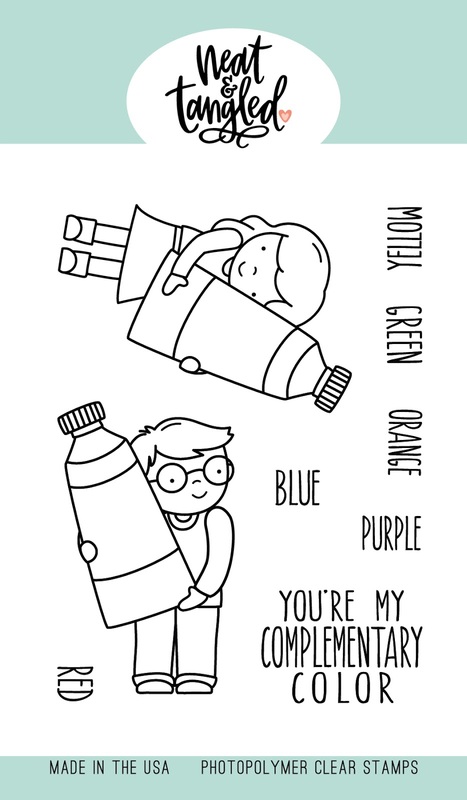 I used them on a graduation party last week, and I colored extras to use on a card. I wanted to use a plaid with the Mondo Sakura image, like I did for all of the party decor, but wanted to keep things brighter and lighter than the black and white gingham. I opted to use the smaller plaid image found in the Plaid Maker set, and stamped it out to cover a panel in a light blue. 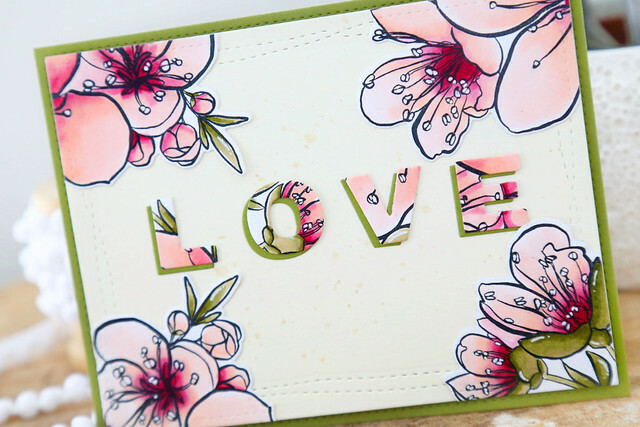 I then layered a few of the flower clusters onto the card front and snipped what hung off of the area. A simple banner flag sentiment (the die is from the new Parcel Box die collection) finished things off. I did a soft watercolor wash on the background, in turquoise and yellow, and then also watercolored a sandy base for my hippo and seagull to stand on. It's hard to tell, but I die-cut the word SUMMER from the same watercolored sheet as the sky layer - it's very soft and pretty in real life! I added the clouds from the Making Waves die set, and colored their edges with a soft blue-green copic marker (BG11). Before you go, don't forget to leave a comment! 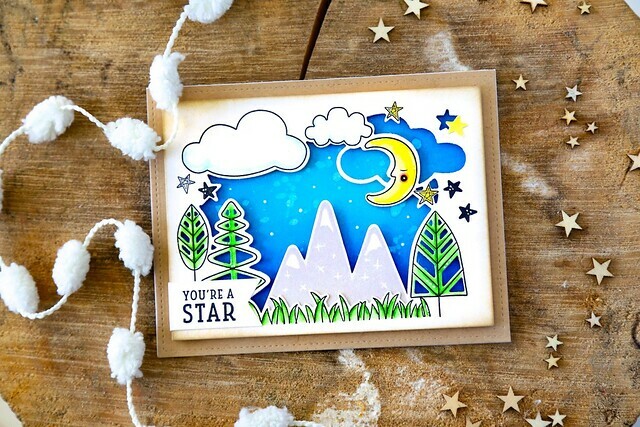 At the end of the week Danielle chooses a winner from among all of the comments left of the design team's blogs - you could win a $25 store gift card! 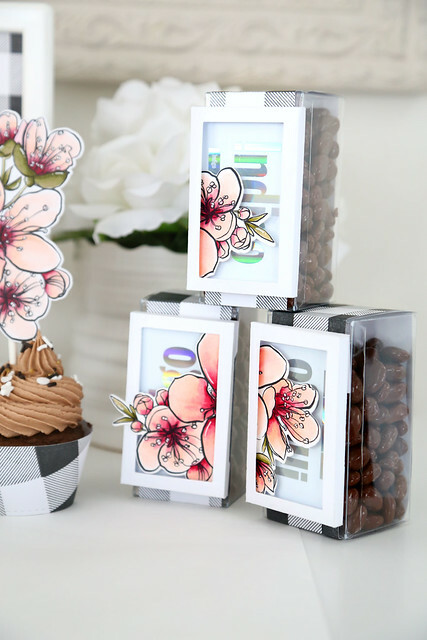 Elena here with a girly take on a graduation party, using the new EBE May release stamp sets and dies. Everything you see here will be available for purchase on Sunday, so this is a fun sneak peek! I love, love, love these new sets! 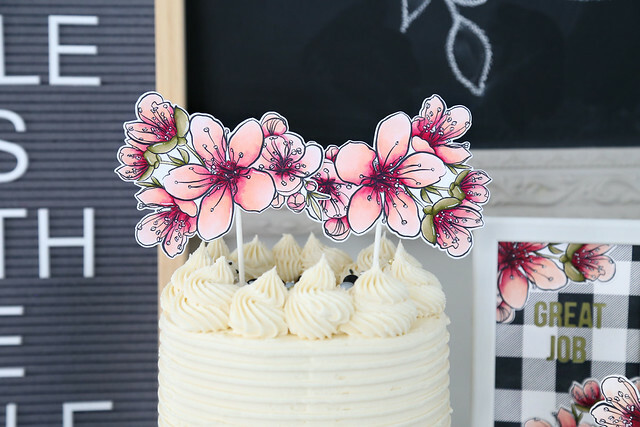 The Plaid Maker set and Mondo Sakura flowers don't look like obvious choices for a graduation party, but I hope you love them together as much as I do. 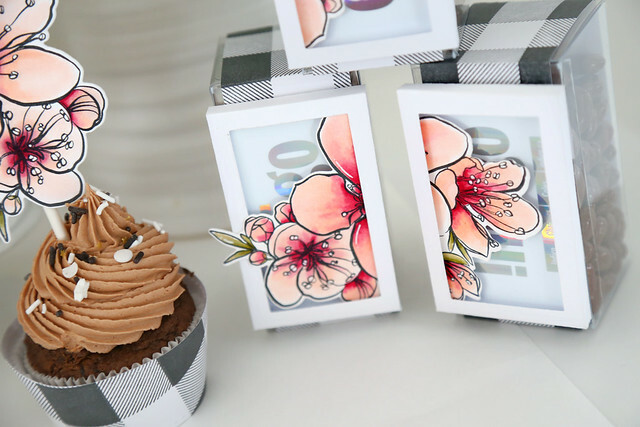 To create all of the party decor, I stamped a few sheets of plaid. Yes, a few sheets. It sounds daunting, but this set is so forgiving! I can see stamping wrapping paper with it for Christmas - eek! 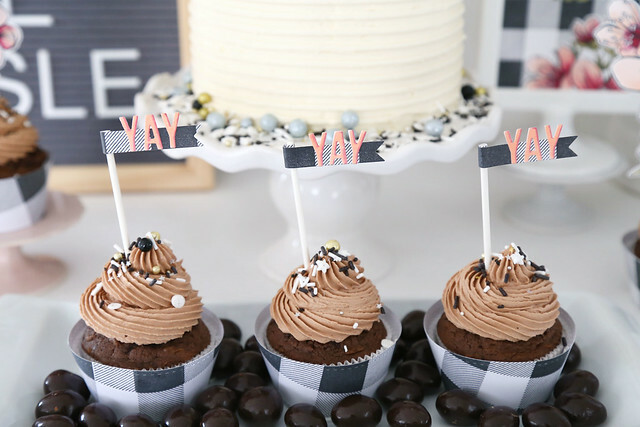 In the meantime, I did a classic black and white check and used it to create cupcake wrappers and little flags. 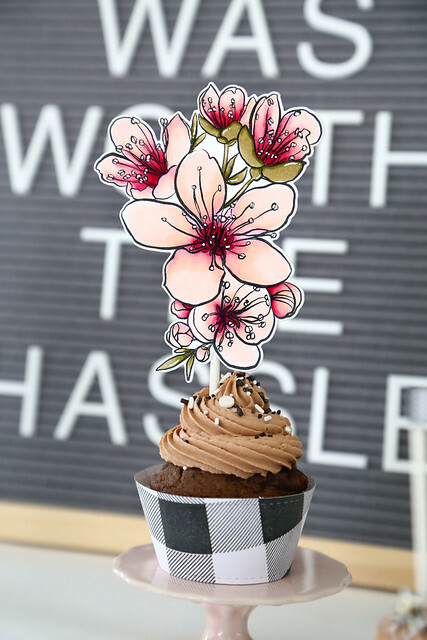 and one, standing upright, made the perfect and most dramatic cupcake topper. 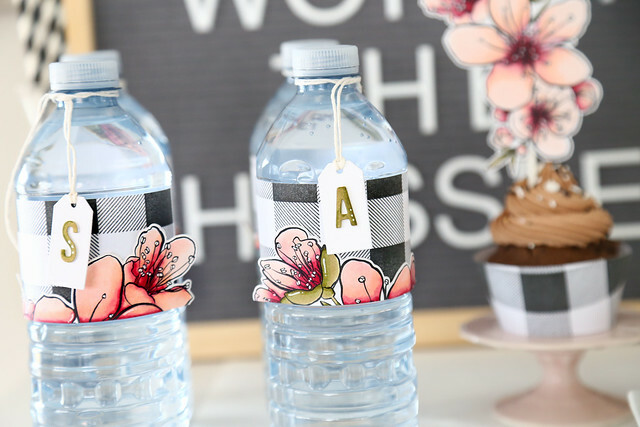 I wrapped waterbottles with the plaid paper that I stamped, and cut some of the flowers to add just a hint of them, without overwhelming the plaid. 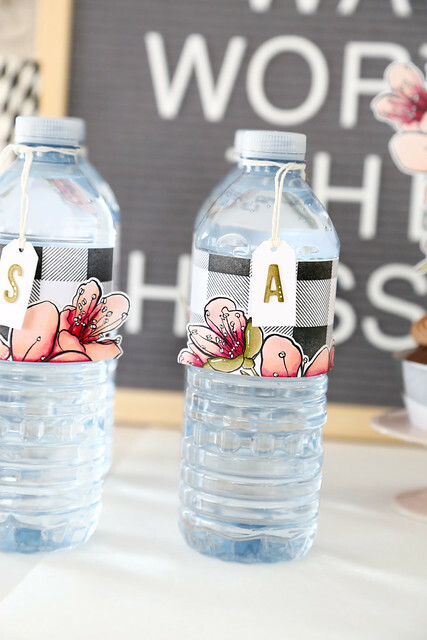 I used the letters found in the Blockwords dies to monogram each water bottle, and placed them onto a tag included in the Parcel box die set.